The Captains of India and Pakistan for Asia Cup 2018. 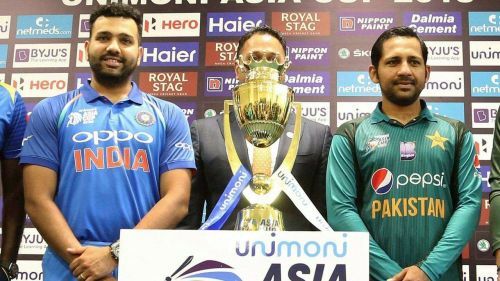 One fact that is more baffling than any other record or stats is that, despite featuring in almost every edition of Asia Cup since its inception in 1984, India and Pakistan have never faced each other in the finals of the tournament. In fact, either one of the two teams has made it to the finals in every edition, but never have the two made it together to the final in the 14 editions that have taken place so far. With Bangladesh defeating Pakistan in the final super four match to book a meeting with India in the finals, the prospect of watching the two neighbours and arch-rival in the finals took a huge blow. However, even though they have not faced each other in the finals of Asia Cup, the two are not strangers to facing each other in the summit clash. In fact, the two teams have had together made it to the finals of quite a few ODI tournaments. Sachin and Dada helped India win the 1st and 3rd Final. The one-off 1997-98 Silver Jubilee Independence Cup was not just an ordinary cricket tournament by any means. Organised on the occasion of host Bangladesh's 25th Independence Day Anniversary, the tournament featured three Asian Teams - the hosts, India and Pakistan - playing each other once before the best of three finals. What made the tournament even more interesting was the fact that India and Pakistan faced each other in the finals. The first final in Dhaka was a completely one-sided affair, with India easily chasing Pakistan's meagre target of 213 in just a little over 37 overs and with 8 wickets in hand. Sachin Tendulkar was the hero of this match, with his 3 wickets and a phenomenal inning of 95 laying the platform for India's win. Levelling the series in the second final, Pakistan made a stunning return by first bowling India out for just 189 and then chasing the target in just 31.3 overs. After two low scoring matches, the third final was one of the highest scoring affairs between the two teams. Thanks to the twin centuries by veterans Saeed Anwar and Ijaz Ahmad, Pakistan posted a mammoth total of 314/5 on the board in 48 overs. Even that wasn't good enough for them as a blistering century by Sourav Ganguly and useful knocks by Sachin Tendulkar and Robin Singh took India past the target with one ball to spare, hence giving them the win in that monumental tournament.